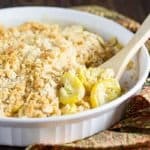 This cheesy and creamy Broccoli Au Gratin is sure to be a favorite side dish at your next potluck or holiday dinner! 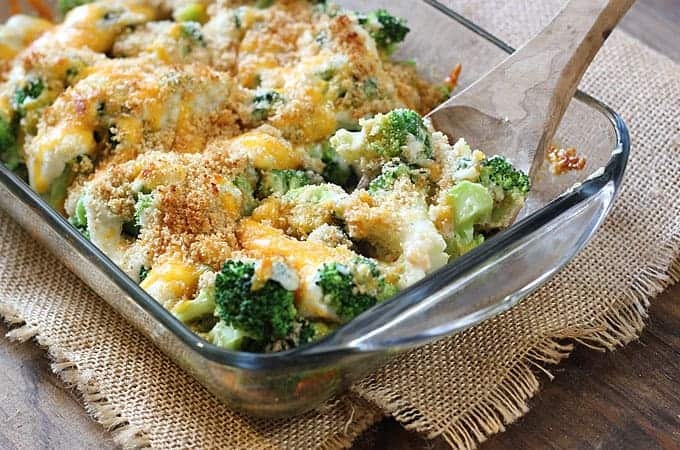 I’ve never been a fan of plain broccoli… it has to be drowned in cheese, ranch dressing or in a casserole of some sort. 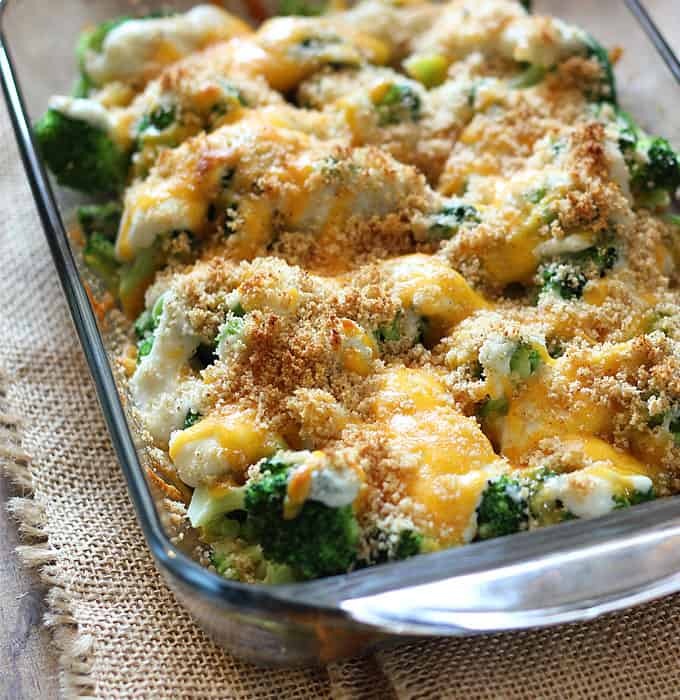 Creamy sauce is drizzled over crisp-tender broccoli, then topped with shredded cheddar cheese and crunchy bread crumbs to create the most ultimate broccoli side dish your guests will love! I could (and did) eat it as a meal. What’s your favorite way to prepare broccoli? Preheat your oven to 450 degrees F. Grease a 2-quart casserole dish or spray with cooking spray. In a saucepan over medium heat, melt the butter. Slowly add flour while whisking. Whisk until smooth. Continue to whisk constantly for 1 minute. Add the milk, salt and nutmeg. Continue to whisk constantly until mixture comes to a boil. Reduce heat to low and simmer, stirring occasionally until the sauce is thickened, about 5-7 minutes. Add pepper and whisk again to combine. Remove sauce from heat and set aside. Prepare frozen broccoli florets according to package directions to cook them to a crisp-tender consistency. Drain broccoli florets in a colander. 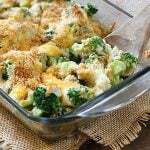 Place the broccoli in the greased casserole dish and sprinkle with half of the shredded cheese. Evenly drizzle white sauce on top of the broccoli and cheese. Sprinkle with the remaining cheese. Sprinkle evenly with bread crumbs. Bake (uncovered) until lightly browned and bubbly, approximately 20 minutes. 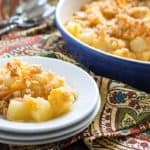 Love gratins! 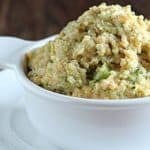 This broccoli version looks incredibly comforting and delicious – definitely craving some of it right now! Thanks so much, Thalia. Hope you have a great Thanksgiving! 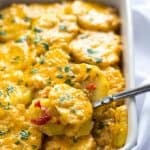 Oooh, LOVE anything au gratin. 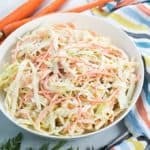 Pinning this beautiful dish to try soon. Do you think if I prepped this two days before Xmas I could then stick it in the oven on Christmas Day? I wouldn’t recommend it, although I’ve never tried it. Good luck and Merry Christmas! I think you could. The sauce and broccoli are already cooked. 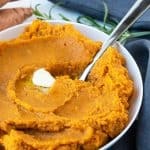 I just prepped mine to bake tonight. 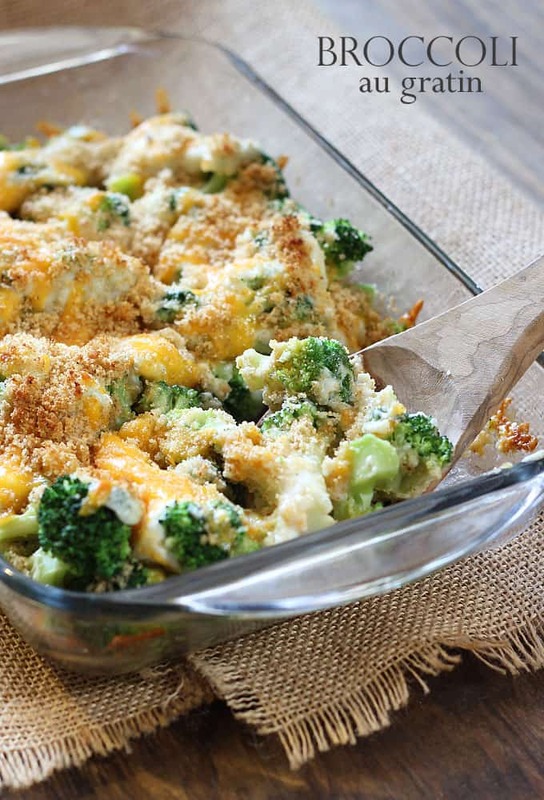 Do you cook the broccoli prior to combining all ingredients to put in the oven? Or are you adding the broccoli FROZEN to the casserole dish and then baking for 20 min as written?